This review includes an analysis of both the Sony A7R and the A7. Sony has gone above and beyond with both the a7 and a7R, bringing Professional image quality and performance to a much more compact ILC. If the price does not scare you away, you will be thrilled with the performance and image quality from these compact cameras. Read more in our Full Conclusion. In late 2013, Sony announced two impressive new Alphas Series cameras. The α7 and α7R are -- as of October 2013 -- the world's smallest full-frame interchangeable lens cameras. Both cameras include full-frame image sensors mated to the new, 3x faster BIONZ "X" image processing engine, as well as Full HD 1080/60p Video Recording with full P/S/A/M exposure controls, a XGA OLED Tru-Finder (2.4M dots), a 3.0-inch tiltable LCD display, and 9 customizable buttons with 46 assignable functions. Wi-Fi is built in to both new models, so users can use Sony's PlayMemories Camera Apps with compatible iOS and Android smartphones. More apps are coming for the α7 and α7R, but for now the only two available are Multiple Exposure App and Smart Remote Control. Multiple Exposure automatically combines sequential exposures into one shot. And the Remote control app allows you to control your camera and adjust settings from your phone. NFC (Near Field Communication) is available with enabled Android devices as well. So what are the major differences between the α7R and α7 models? The α7R costs approximately $600 more than its sibling and is designed for professional photographers and advanced enthusiasts who need a smaller, secondary full-frame camera. The α7R features a 36.4-megapixel Exmor CMOS image sensor with no optical low pass filter (most have them) for "added resolving power and increased image detail." The α7R also includes the new Fast Intelligent AF (auto focus) system with Lock-on AF, Eye AF, and Flexible Spot AF. For about $600 less, the α7 is designed for mid-level APS-C DSLR users. It also includes Lock-on AF, Eye AF, and Flexible Spot AF, but in a slightly different Fast Hybrid AF system, which combines Phase-Detect & Contrast-Detect AF methods. You also get 5 frames-per-second continuous shooting (with auto focus) in full resolution off the 24.3-megapixel Full-Frame Exmor CMOS image sensor. 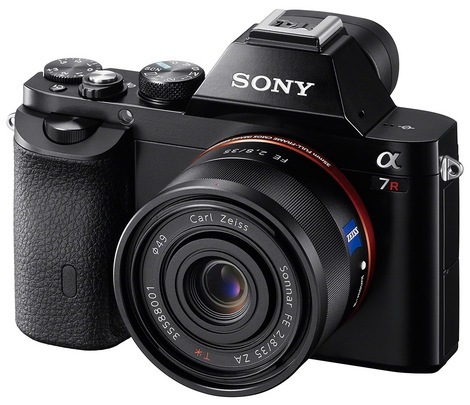 The Sony α7 and α7R are available in the following configurations. The α7R will be offered body-only with a $2300 MSRP. The α7 body-only version will have a $1700 MSRP, or you can purchase the α7 + a 28-70mm F3.5 - F5.6 full- frame lens (model SEL2870) for about $2000. See the most current online prices at the top right of this page.